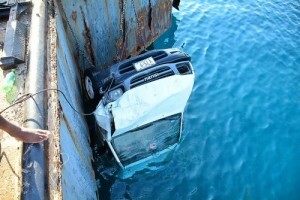 WILLEMSTAD - Yesterday by unknown cause a pickup reversing at Baya Beach ended up in the water. Several divers were in the neighborhood and even some who were before just out of the water dived back into the sea and managed to get the driver out of the car. The driver was brought to the hospital in a precarious situation. The pickup was hoisted out of the water with a crane. Police are now investigating how the accident could have happened.